With more than three decades of experience in premium carpet care, iCleanCarpet.sg is an established market leader that can provide you with the best service possible. With teams located throughout the island, we are a professional carpet cleaning company providing reliable 24-hour carpet cleaning services in Singapore from Monday to Saturday and are usually able to provide same day service. Furthermore, with our iCleanCarpet.sg Stain Eraser, we can help remove deep, tough stains while protecting your carpet’s colour, texture and brightness. Our experience and expertise means that our professionally qualified team is able to accurately analyse the type of carpet and apply the right method of cleaning and drying, ensuring that your carpet is wonderfully restored and maintained. In addition, we also install and provide carpets for our customers. Singapore’s hot and humid climate can be difficult for carpets, due to mould, fading and shrinkage. Mould starts to grow in places where there is a lot of moisture; and some cheap carpet-cleaning firms will not ensure that your carpet is thoroughly dry after cleaning, which may result in mould in areas that are not exposed to sunlight or are covered by furniture. Most importantly, maintaining a clean carpet can improve the overall air quality, resulting in a safer, cleaner and healthier indoor environment. Proper cleaning and maintenance will also mean that your carpet will have a longer lifespan. Hence, if you have already made an investment in carpets, don’t waste that investment by neglecting them. To protect your carpet after cleaning, we offer carpet protection treatment to repel spots and stains from permanently damaging your carpets. We also offer world’s only non-leaching Aegis anti-microbial treatment for surface fabric treatment to clients who have immuno-compromised occupants or who are sensitive with mold, bacteria and micro-organisms, to reduce the microbial load in your indoor environment. To provide the best for our customers, we invest into wide-ranging, specialised cleaning techniques that produce optimum results while causing minimum disruption to your daily lives. Some of our techniques do not even produce any noise, meaning that you could even hold a meeting next door or continue running your business operations as usual while we clean. 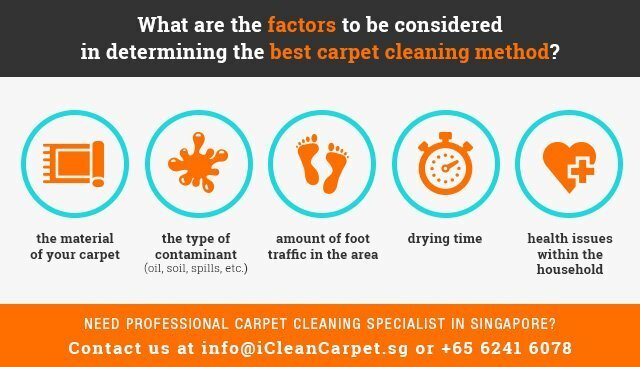 iCleanCarpet’s carpet cleaning Singapore services are quick, convenient and hassle free. Our carpet technicians are extensively trained and knowledgeable, and would go the extra mile of any one of our customers. Contact iCleanCarpet now!